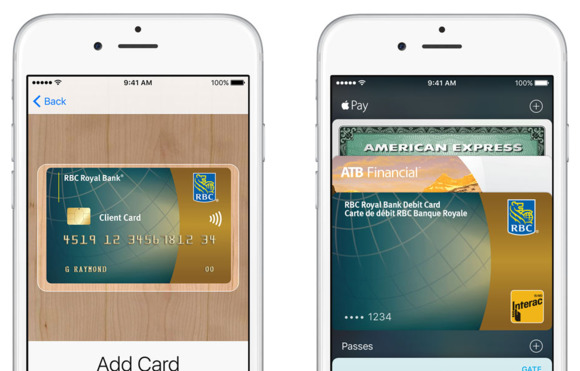 Canada's big banks are finally on board with Apple's mobile payment service. Apple Pay rolled out in Canada last November, but its existence was so limited that it was barely useful. Only AmEx cards were supported at launch, leaving out most Canadian iPhone users. That changed Tuesday with the addition of two major Canadian banks, with more coming soon. Apple’s mobile payment system now supports MasterCard, Visa, and AmEx cards from Royal Bank and Canadian Imperial Bank of Commerce, in addition to those banks’ Interac debit cards, with Bank of Montreal, Toronto-Dominion Bank, and Bank of Novia Scotia planning to integrate with Apple Pay soon. Interac is also planning to bring Scotiabank and TD Bank debit cards on board. Interac handles debit card transactions for banks, so without its cooperation, Apple Pay would’ve been restricted to just credit cards. ATB Financial will be adding its debit cards to Apple Pay at some point, and Canadian Tire Financial Services will join with just credit cards. So what’s the holdup? According to the Financial Post, banks have been concerned with privacy and fees. Apple takes a cut of Apple Pay transactions, though it’s unclear how big of a percentage the company asks for. CIBC, RBC, and Bank of Nova Scotia were also pushing their own apps. Apple Pay is now available in six countries, and Apple Pay VP Jennifer Bailey told the Financial Post that the service is adding 1 million new users every week. The rollout is clearly happening very, very slowly, but Apple is laser focused on services as hardware sales decline. There are a slew of moving parts to Apple Pay’s expansion, but a year and a half after its launch, Apple is clearly still committed to mobile payments.